Learn everything you need to know for attending or planning a Jewish wedding. Have you been invited to a Jewish wedding but don’t know what to expect? Jewish weddings are full of Jewish rituals and traditions but not everyone follows all of them. The most common wedding rituals seen today are the ketubah (marriage contract), the chuppah (wedding canopy), the Sheva Berachot blessing, and the breaking of the glass. 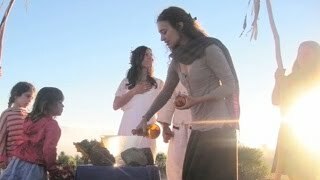 Explore our videos to learn the basics about common Jewish wedding traditions. If you want to learn more about all the rituals and traditions of Jewish weddings, check out more resources from our partners at My Jewish Learning. Jewish weddings take place under a canopy called a chuppah – the canopy itself can be made of almost anything – but it creates a spiritually charged area for the couple during the wedding. Learn more about the honor of creating one, standing under one, or helping hold one up for your friends during their Jewish wedding. While certain traditions appear in most Jewish weddings, there is always room for reinterpretation and reinvention. Whether you’re planning a wedding or attending one, these videos can give you a brief explanation of the history of these traditions, and the many ways that couples have found of adapting them to our own time, and their own relationship. What is this breaking glass thing all about? Sure it’s fun to break things, but that’s not the only reason that we break the glass at Jewish weddings! There are many different interpretations of this tradition, so we’ve collected three. This particular video about breaking the glass is part of a larger series exploring the basics of Jewish Lifecycles. Jewish tradition is often specific. There are a myriad of Jewish subcultures and people, and the conversations in this series explores the array of choices people make in interpreting ritual today. 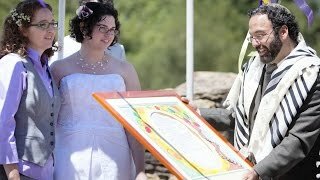 Learn more about Jewish Wedding traditions, Jewish Mourning Traditions and Jewish Baby Traditions. In Jewish weddings it is customary for the couple to break a glass. For this video, we asked the Jewish community for their advice on what type of glass to smash at a wedding and even how to smash it. So, we took some of their advice and actually smashed a bunch of different items, a bunch of different ways. This decision, about what type of glass to smash, will be entirely up to you but hopefully we’ve given you some choices for your wedding. Mazel Tov! If you want to learn why Jews break a glass, watch our other video. The Jewish wedding dance is super famous, and it’s called the Hora! When Hava Nagila starts playing, you don’t want to be the only one in the room who doesn’t know the hora! To really dance like a pro, learn the words to Hava Nagila, and Siman Tov and Mazal Tov with our other Judaism 101 videos! Just as Judaism offers rituals to make marriage sacred…when divorce is necessary, Judaism also provides a sacred context. Interesting, right? While issues about ending a marriage can be messy and complex we have explained the one piece that can be rather… simple.